Start off strong...finish stronger. Start with a plan. You know what you're looking for. Increased user productivity. Improved communications. Resource optimization. Reduced costs. The question is: how are you going to get there? Our consulting services provide answers. Long before you take your new system live, we start making the Finesse ERP system work for you. With 20 years' experience, we know how to ask the right questions to ensure that we thoroughly understand your company's information needs so you can take full advantage of the Finesse system. In addition, our industry knowledge helps us move you through the implementation process because we are so focused on your business. And from planning through execution, we are prepared not only to help you reach your goals, but to increase your return on your already sound investment in the Finesse ERP system. Then, over the years, our ongoing Consulting Services will help you respond to changing business or market conditions to assure your continued success. So when you purchase Consulting Services, you're getting comprehensive support services and a strong, reliable company devoted to long-term partnerships. We shine when it comes to implementation and a smooth transition. From the beginning, you'll be assigned an experienced Enhanced Systems' consulting team member as your primary coordinator to orchestrate our broad range of services. In addition to focusing the work, this makes your job easier by giving you a single point of contact to get you the answers you need as you need them. And we work fast - it typically takes us just 60 days to initiate a live production. The next job is to establish Finesse in your existing business environment. Our Implementation Program combines education, implementation consulting services and proven methodology to help you take advantage of the Finesse system's powerful capabilities right from the start. It's a process that takes careful planning and collaboration. As you work with our highly skilled Implementation Consultants, you will see how quickly and easily you can achieve the results you want. Following software installation, our technical consultants will help you train your staff to for ongoing tasks such as installing additional modules, handling print documentation on demand and using an array of Finesse installation tools. We will also help you set up security and establish users and peripheral devices such as printers on your Finesse system. And, if you are like many of our customers who have a lean IT staff or may not even have one at all, you'll find that our experts are an invaluable resource for additional help with your technical decisions throughout the transition and beyond. Our long-term commitment for your long-term benefit. Our commitment to long-term partnerships is most evident in our range of continuing support services. To keep your system running effectively and efficiently over time, we offer a comprehensive program of periodic reviews and consulting. Solving unique problems with application consulting. 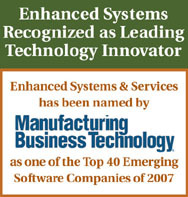 Enhanced Systems' Application Consulting services are designed to ensure Finesse is optimized for your business. Experts in finance, manufacturing, systems analysis and implementation provide on-site consulting as needed. When you need specific issues addressed, or when you have particular problems or questions, you get fast, courteous and knowledgeable attention and support from our professionals. Optimizing performance with system consulting. System Consulting helps you maintain and enhance system efficiency and effectiveness as well as staff productivity. Whether you want to improve system performance, resize your database or guarantee users satisfaction and productivity, Enhanced Systems can help. System consultants are available for on-site, expert analysis of simple or complex performance issues. Their concise reports include findings and recommendations, so you can anticipate problems before they arise and make future plans with confidence. Ensuring productivity with application reviews. Change defines the business world. Survival is based on anticipating it. Our periodic application reviews ensure that your Finesse capabilities are maximized for your business environment. Our team will review the system and make recommendations based on their findings and your concerns. Planning, implementation and ongoing consultive services are aimed at creating a system that continually meets � and exceeds � your needs and expectations. Project management is all about maintaining control. From project planning, budgeting, performance and scheduling to ensuring flexibility, building teams, defining resource requirements and setting milestones, our systems implementation process makes the job easier. Implementation is often a good time to review business practices and re-engineer them in light of your new objectives. We can help each of your teams through this key process and provide the technical assistance your IS team needs as well as intensive hands-on training and practical expertise...all with a very personalized approach. In addition to basic technical skills, we provide a complete instructional package tailored to your needs. Early sessions include system basics, navigating applications, functionality and simulations. We can also incorporate more comprehensive skills with each user group based on their need. No Enhanced Systems service is ever generic. Unlike other companies, we learn each functional area within your industry company and the tasks each person needs to do and we train on those specific tasks. So, instead of the large group classes of others, we teach your staff in small groups or one-on-one. This greatly reduces training time and costs and increases retention, because your people learn only what they need to know. Every system conversion involves bridging the old system to the new � no matter what the old system is. Part of our implementation system support for your IS team includes discussing and demonstrating data manipulation techniques as needed. This additional support can prove invaluable in making a timely and successful cut-over. Over the years, we've tackled some very challenging conversions, including converting data from a long-discontinued Winchester drive the manufacturer no longer supported. Even then, we captured the data and got the client up and running quickly and smoothly. In addition to knowledgeable phone support, we offer pager facilities for emergencies and dial-up modem to expedite technical diagnostics. In most cases, you can count on resolving your situation with one contact. Ongoing support service is strongly recommended to make sure you get the most out of your Finesse system. Finesse is constantly evolving with latest best practices, technologies and functionality. Our updates and new versions come from our observations, customer and manufacturing industry ideas and government requirements. Unlike many larger vendors, our size allows us to be our extremely agile, so we can incorporate new functions, technologies and changes much faster than many others. In fact, we'll often incorporate new customer requirements prior to the system's purchase. Although most customers find the Finesse system meets 80% or more of their requirements, we can also perform specific software modifications. If other customers can benefit from your change, it will be incorporated as a standard Finesse enhancement and we will support it as part of your standard maintenance agreement. Because we focus exclusively on the projects-oriented manufacturing industry, Finesse often delivers a 90% or better fit right off the shelf. Best practices indicate initially using the Finesse system in its original version. After live production, most users find that they no longer require the software modifications they thought they would need. When modification is still required, we work closely to understand and meet their requests efficiently and in a cost-effective manner.